Walter Levin once kicked a boy out of his apartment who would grow up to be America’s greatest living conductor. The problem: Young James Levine hadn’t finished his homework. Watch Evi & Walter: Day One. Watch the full video here. “Jimmy,” as Walter still calls the Metropolitan Opera’s music director, had to sit on his music teacher’s front doorstep in Cincinnati for 2 1/2 hours, until his mother picked him up, Walter says in his biography. If the boy wanted to keep taking lessons, then things would be done the teacher’s way, Levine recalls Walter saying. Levine — who remembers waiting only about an hour for his mother — says it was a minor disagreement in a close relationship that has spanned six decades. “This man was, if not the most, certainly one of the most brilliant musicians I ever worked with, who taught me and stimulated me to learn the entire world of music,” Levine, who was the Ravinia Festival’s longtime music director, says of his mentor, now 91, facing the ravages of dementia and living with his wife at a Hyde Park retirement apartment building. Despite his fearsome reputation, Walter Levin was a revered violin teacher. Evi often finds herself narrating her husband’s past these days. It’s one of the ways she has tried to keep his musical life alive since his dementia diagnosis in 2011. The year before, Walter, then 85 and still teaching, lived with Evi mostly in Basel, a Swiss university town on the Rhine River, in a third-floor walk-up apartment with no elevator and a piano shop below. When he wasn’t teaching at the Basel music academy, he and Evi would fly to Paris, Madrid, Vienna, Salzburg and elsewhere so he could teach. Holidays, they’d spend at their apartment in Cincinnati. Late in 2010, Walter was walking near Basel’s busy main square, hurrying to a young Chinese quartet’s rehearsal at the academy. Evi got a call at home from the academy: Walter hadn’t shown up. 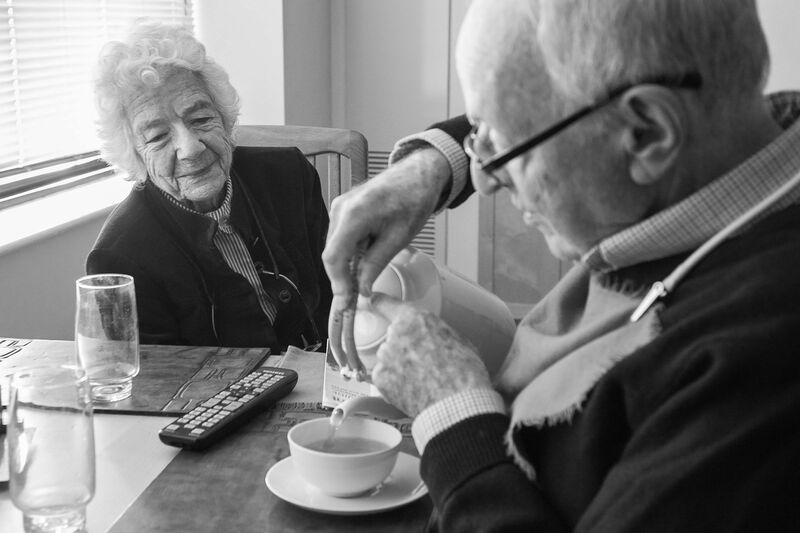 “I started to get very worried,” says Evi, now living with Walter at the Montgomery Place retirement apartments in Hyde Park. The phone rang again, this time a hospital calling. Walter had been crossing the street as a tram approached. The driver hadn’t been able to stop in time. Evi rushed to the hospital. No one is sure what led to the accident. Walter insisted he’d lost his balance and fallen. Not long after that, Evi awakened one night to find her husband lying on the floor of their bathroom in a pool of blood. He had no pulse. He was rushed to the emergency room. His heart stopped. Doctors implanted a pacemaker, and he survived. Walter’s family soon began to notice something else. In Zurich, he gave a lecture covering material he knew so well that he kept a script at hand more out of habit than necessity. But this time, he got lost, and even with the script, he couldn’t find his place. Another time, David Levin remembers driving his parents to the Zurich airport for their holiday trip to Cincinnati. In Cincinnati, doctors said Walter needed a stent for a blocked coronary artery and that his trans-Atlantic travels had to stop because his heart could no longer handle the strain. 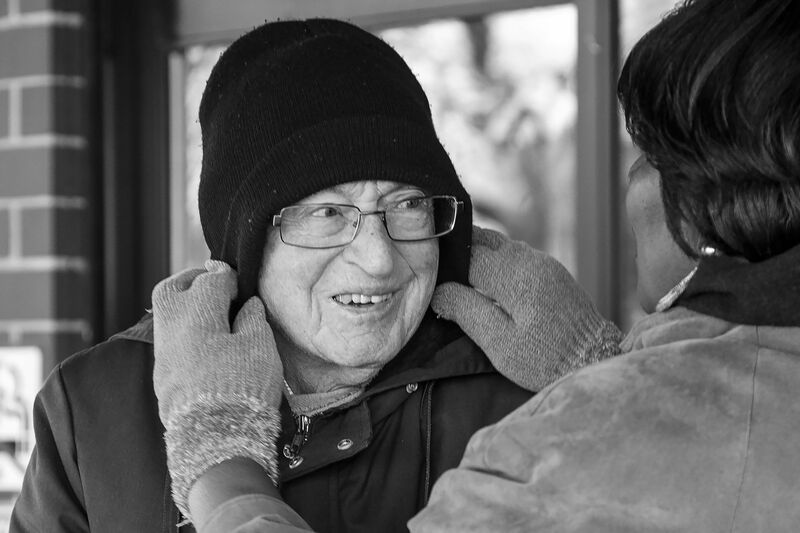 More devastating to Evi was the rest of the diagnosis: Walter had vascular dementia. The doctors suspected that a series of small strokes had caused his recurrent falls and that the cumulative damage from those strokes, blocking the flow of blood to the brain, had caused his dementia. The prognosis wasn’t good. The disease is progressive. It has no cure. David and his brother Tom helped their parents look at retirement homes in Chicago and New York. Walter and Evi chose Montgomery Place. They liked that it was near Lake Michigan, that many accomplished people lived there and that it was a short walk from where David teaches, at the University of Chicago. “It’s the best decision we’ve ever made,” Tom says. Whenever possible, Evi lets Walter do things for himself, including pouring tea in their apartment at Montgomery Place in Hyde Park. One day — Evi can’t pinpoint it exactly but around the time the couple moved to Hyde Park in the summer of 2011 — Walter mostly stopped talking. Just stopped. The man once so able and eager to discuss music, philosophy, art and literature is now, for the most part, mute. Walter now depends on Evi for almost everything: choosing his clothes, his meals; leading him to the toilet. 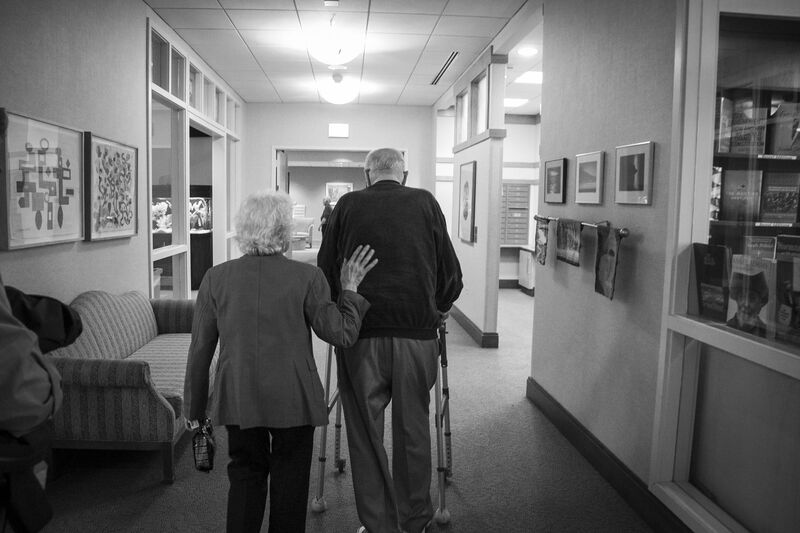 Every morning, a caregiver comes in for three hours to help with the basics. Walter’s caregiver bundles him up against the cold. Evi accepts that this is their life now. But she struggles with their fate at times. When, say, someone asks Walter a complicated question, she momentarily freezes, uncertain whether he’ll say something, the wrong thing or nothing at all. His doctors can’t predict how quickly the dementia will progress. His sons no longer recognize someone they remember dominating most any conversation. Something has happened to Evi, too. “Suddenly, a space opened up, and into that space my mother just exploded with her energy,” Tom says. 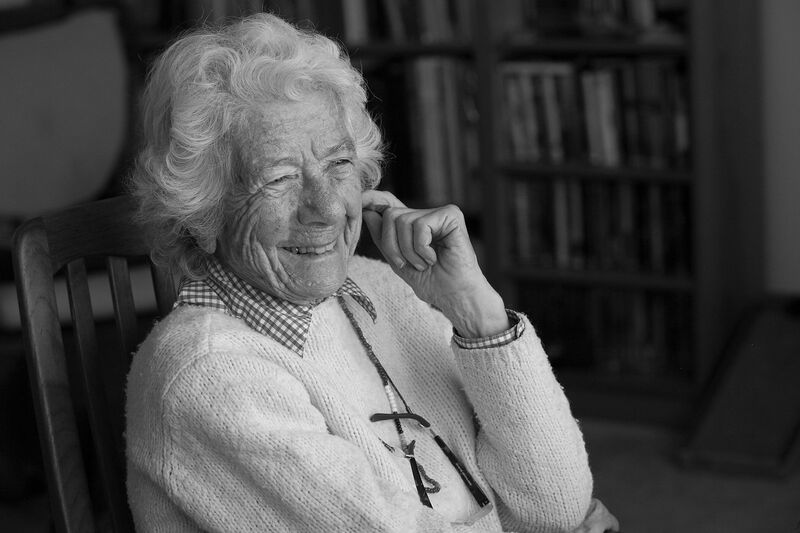 Evi still loves life, despite the difficulties that have come with old age. Evi now hosts a monthly German dinner at the retirement center. At a recent one, she even chides a guest for drifting from the agreed-upon German to English. “Phil, auf Deutsch!” she gently scolds. Evi helps edit Montgomery Place’s monthly newsletter, hosts foreign film nights and entertains an endless parade of guests, many of them from the Levins’ musical past. “I invite some of the residents to be with us because I don’t want to be alone with Walter because he doesn’t speak, and I want to have rapport,” she says. 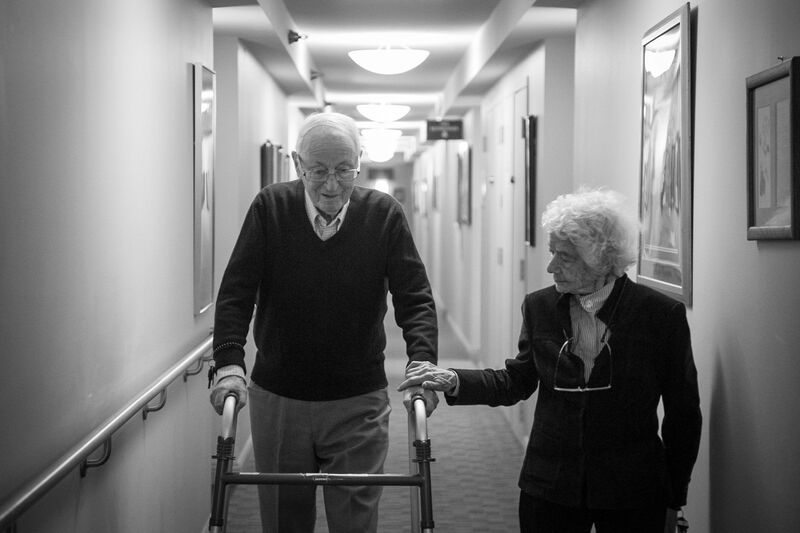 Despite what’s happening to Walter, Evi, at 92, isn’t ready for her own life to end. Three and a half years ago, her only sibling, an older sister, had a bad fall. The doctor gave her a choice: surgery or just something to keep her comfortable. Days after the fall, her sister died. Oliver Sacks, the famed British neurologist and author who died in August, once suggested that in even the most damaged brains, the parts that process music can somehow survive. In his book “Musicophilia,” Sacks wrote of patients who might no longer recall how to put on their pants but could still sing or play the piano perfectly. “It is as if identity has such a robust, widespread neural basis, as if personal style is so deeply ingrained in the nervous system, that it is never wholly lost, at least while there is still any mental life present at all,” Sacks wrote. 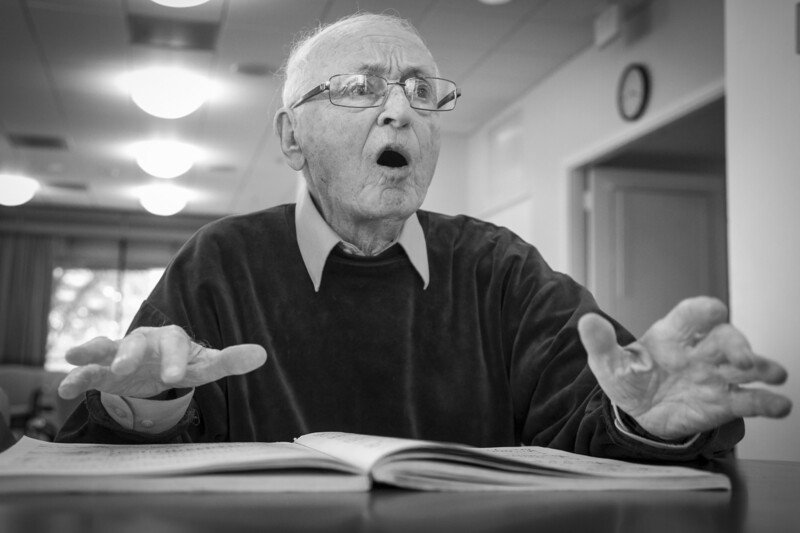 “I have seen deeply demented patients weep or shiver as they listen to music they have never heard before,” he wrote. 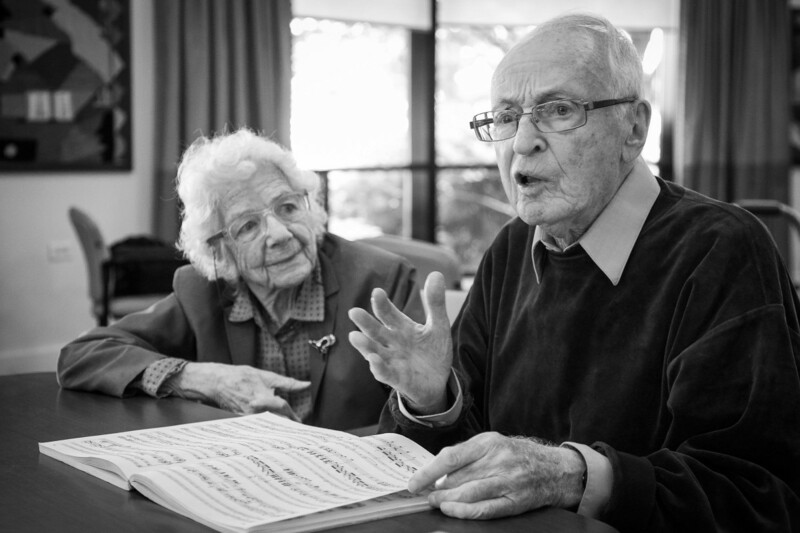 The members of the Ariel Quartet — once students of Walter’s in Europe — have remained devoted friends of both Walter and Evi, visiting them often in Chicago. They’ll talk with Walter about music. Which Russian composer does he like most? Least? If you could talk with any composer, which one would it be? Depending on the time of day, Walter’s answer might be a single word, or a sentence, occasionally more. Walter also can still recite perfectly the Hebrew he learned as a child. Walter and Evi at Montgomery Place. Phyllis Booth, another Montgomery Place resident, had heard about Walter and knew he has dementia. Still, she needed someone to help guide her amateur trio through a tricky piece by Beethoven and hoped he might help. So one afternoon, Evi leads Walter to a sunny recreation room where Booth is practicing with her cellist and pianist. The music floats up the corridor as they approach. “Can you hear them playing?” Evi asks. When Walter and Evi enter the room, the trio stops. There’s a flutter of nervous laughter. The players don’t know what to expect, just that this is a man who has taught and critiqued some of the world’s finest musicians. Evi guides Walter to a table facing them. It’s bare except for a pencil and the musical score. This is the way Walter has always liked it when he’s teaching: only the essentials. 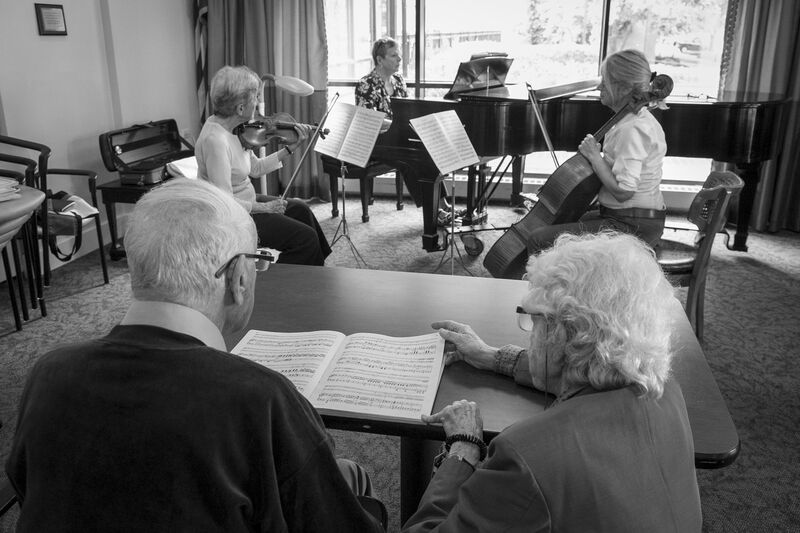 With Evi at his side, Walter coaches an amateur trio through a Beethoven piece at the couple’s retirement center. It’s one of the ways Evi tries to help Walter keep music in his life. Evi and Walter sit. She opens the score. They hold hands under the table. With her other hand, she turns the pages for him to follow. The musicians begin. The violin is a little off-key. There’s a pause. Booth apologizes that she has shaky hands and feels as if she’s just “banging” her instrument. After a few minutes, Walter speaks. “The main thing I would criticize is that you don’t do the dynamics,” he says, talking about the lack of variety in intensity. Evi makes sure Walter is on the right page as he coaches the trio. They begin again. This time, something is different. It’s not the music. It’s Walter. His eyes flick back and forth from score to players. Evi loses track for a moment, and Walter, paying full attention, lifts a finger to signal her to turn the page. “Again, for me, your dynamic changes are not strong enough,” Walter tells the trio, more insistent now. The vacancy in Walter’s eyes is gone. His brow is pinched. Evi lets go of his hand because Walter needs it to tap on the tabletop. Then, he’s thumping it with a fist. Midway through coaching the trio, Walter comes to life. The man who rarely speaks is suddenly full of suggestions for the players. He is urgent now, almost pleading. He clenches his fist. He shakes his head when the musicians don’t get it quite right. ​Evi hasn’t moved. But she seems to be receding into the background. All attention now is on Walter, the most alive person in the room. 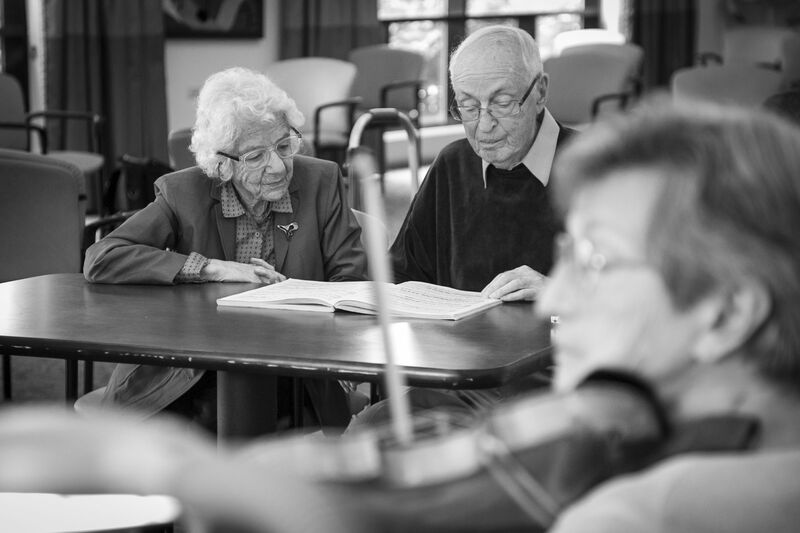 With his wife of 66 years at his side, Walter, 91, and suffering from dementia, coaches an amateur trio through a Beethoven piece. It's one of the ways Evi tries to help Walter keep the music alive in his life. The musicians pack up and leave. Evi and Walter remain in the recreation room. They are alone except for the cleaning lady quietly tidying up. But, for Walter, the moment has passed. He strains to answer what he thought of the playing. He trails off. He has a distant look now, as if grasping for words that are out of reach. He clenches a fist, seemingly in frustration. Then, leaning in to Evi, he says something in German. “He needs to go to the bathroom,” she says. And Evi, her hand resting gently on the back of his green cardigan, guides Walter back home. Evi guides Walter home at the end of the trio’s practice session.